It took us 5 days by Trans Siberia Express Train to reach Ulaanbaatar and the beautiful landscapes of Mongolia which for me personally were the main reason to go on this journey in the first place. A destination like Mongolia takes you away from everything you have ever known and places you in almost surreal surroundings like th Gobi Desert where you will meet the most extraordinary and humble people. The way of life is so basic but at the same time so peaceful and everything is done toghether making guests like ourselves feel more than welcome. 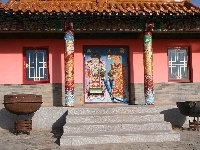 We travelled the Gobi Desert, came across small villages and beautiful temples. We also had a great travel experience visiting and camping in Gorkhi-Terelj National Park about 50 km out of Ulaanbaatar where you choose to go on a day tour of stay the night in a tourist camp. We slept in traditional ger tent and drank butterchai while chatting up with other adventurous travellers which was a lot of fun and one of the best nights during our Siberian adventure. We left Mongolia and Ulaanbaatar by train in direction of Beijing in China. Did you enjoy Trans Siberia Express Train Ulaanbaatar and have you been on a holiday in Ulaanbaatar, Mongolia?